Recent obituaries for Chuck Jonkel, a legendary Montana professor and bear expert, credit him for inspiring an entire generation of wildlife biologists. But he did more than teach humans; he also educated bears, and I think that will prove to be his longer-lasting legacy. Jonkel, who died at age 85, cultivated a certain ursine persona. His salt-and-pepper hair and slight hump to his shoulder were just the beginning. On hikes, he’d point out the wild plants that bears eat, and sample morsels along the way. Like a spring grizzly, he liked to use lodgepole pine trees for a back-scratcher. Jonkel studied all kinds of North American bears, from polar bears in the Arctic to ghost populations of grizzlies in northern Mexico. Although he was most closely associated with the University of Montana, no institution could contain Jonkel for long. I met him when I was a newspaper reporter covering the “bear beat” in Montana. Jonkel was the kind of colorful, credible source that journalists treasure. He delighted in goading agency bureaucrats who, in his view, put politics and careerism ahead of wildlife. I would pull out my notebook when Jonkel walked into a staid meeting of self-satisfied rangers and resource managers. Everyone knew he was about to lob in some verbal hand-grenades. Chuck made for great copy. 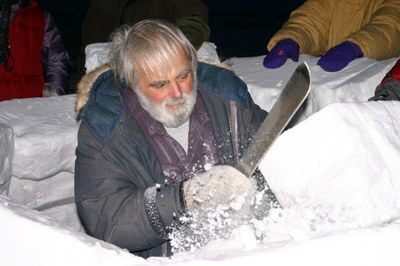 Chunk Jonkel Churchill, Manitoba, teaching a group how to build an igloo on a Great Bear Foundation field course. However, I suspect that Jonkel’s greatest contribution can be found in a little can that weighs about 16 ounces: Bear pepper spray. Back in the 1980s, working with fellow bear specialist Carrie Hunt, Jonkel was seeking a non-lethal way to help keep bears out of trouble. They developed a highly concentrated pepper concoction in a spray can small enough to clip on your belt. Jonkel documented it as an effective tool against aggressive polar bears, which frequented northern outposts when hungry. Today, bear spray is sold throughout grizzly country under brand names like Counter Assault. I bought my first can of Counter Assault in the late 1980s, when I was surveying alpine bear habitat as a summer grunt for the Forest Service. In those days, Counter Assault was viewed with skepticism. My colleagues preferred more traditional “bear medicine,” such as a .44 Magnum revolver. In the 30 years since, bear spray has proven itself over and over again. I’ve interviewed dozens of hikers, hunters and berry-pickers who have repelled troublesome bruins with pepper spray. Scientific studies have also demonstrated the effectiveness of spray, showing it works better than firearms and has the added benefit of leaving the bear alive. Recently, I discussed this with Gary Moses, a career ranger in Yellowstone and Glacier national parks who now is a representative for Counter Assault. Moses notes that, a couple decades ago, two or three visitors were mauled by grizzly bears every hiking season in Glacier National Park. In recent years, the number of maulings has dropped, even as the number of visitors has climbed substantially, and the number of bears has edged up as well. Moses has no hard data to point to, but he believes that the difference is pepper spray, which has become standard equipment for rangers and hikers alike. Now that bear spray is ubiquitous in national parks, hikers are better able to defend themselves from troublesome bears. But that’s just the start of it, Moses believes. Grizzly bears are highly intelligent, and cubs learn life lessons from their mothers. Moses thinks that more and more Glacier grizzlies have learned to avoid people after being hit with pepper spray. Those bears go on to teach their cubs to give people a wider berth. It’s just a hypothesis, but makes sense to me. A few days before Chuck Jonkel died, I found myself with a friend at one of my favorite avalanche chutes in Glacier National Park. It was a place where I’d enjoyed watching bears with Chuck years ago. That evening, my spotting scope revealed a browsing herd of elk. Suddenly, my hiking companion gave an excited shout. A big, golden-brown grizzly waltzed out of the forest perhaps 200 yards away. Instinctively, my hand shot to my belt and my holstered can of bear spray. It was an electric moment, which kept buzzing even after the bear disappeared back into the timber. In the end, it was a beautiful and peaceful evening: Two people and one bear sharing a mountain with mutual respect – and no violence. Chuck Jonkel would have approved. 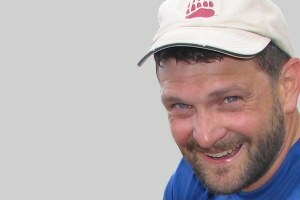 Ben Long is a contributor to Writers on the Range, the opinion service of High Country News. He writes in Kalispell, Montana.